…well, clearly, I was meant to be there. Some of you may have heard of the urban property in Holyoke, MA, known as “Paradise Lot,” now documented in Eric and Jonathan’s book of the same name. The book’s subtitle more or less says it all: “Two plant geeks, one-tenth of an acre and the making of an edible garden oasis in the city.” Eric and Jonathan moved to the property in 2004 and, in ten years, have transformed a barren city lot with “terrible soil” (in their words) into a thriving urban backyard garden with over 40 species of fruit and 70 other perennial plants, a passive solar greenhouse, an aquaponics system, chickens and other micro-livestock, and a tropical garden (in Massachusetts!). At the workshop, Eric and Jonathan walked us slowly through every part of the garden and we discussed the garden design and the plants while sampling juicy berries and pawpaw fruit. 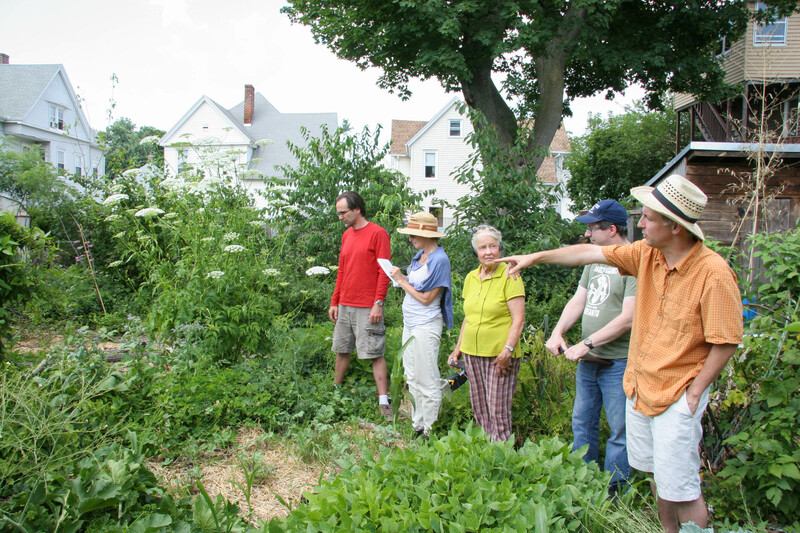 Their knowledge of plants — and all other aspects of ecological design — is really phenomenal: they could rattle off, with their eyes closed, the English and Latin name of any plant on the property, as well as the plant’s family, habitat, needs and uses. How is it possible to grow tropical plants like fig, citrus, avocado, guavas, and bananas in Massachusetts? 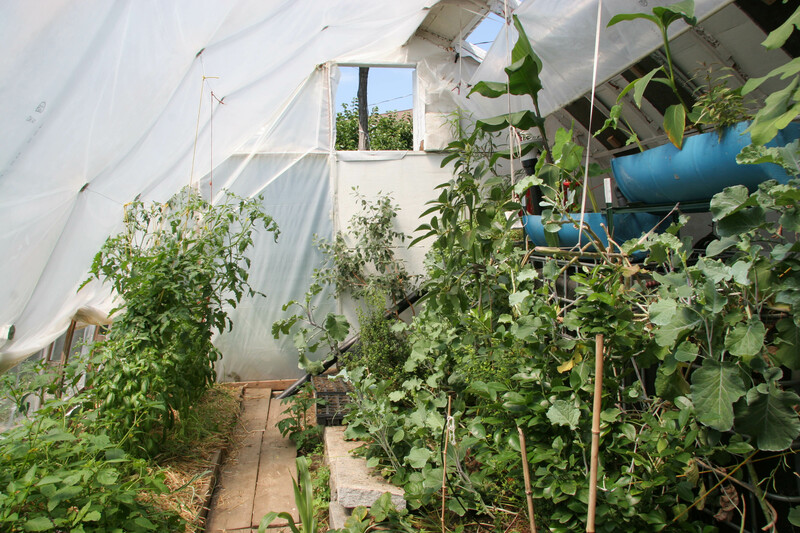 The answer is: by creating a number of different microclimates, simply by drawing on permaculture design principles of relative positioning in terms of sun/shade/wind. 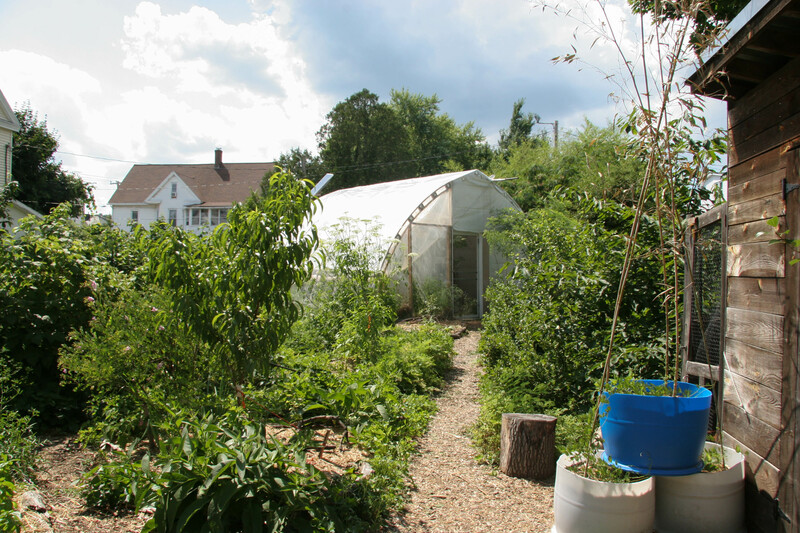 Take a look at Paradise Lot’s greenhouse below. It’s entirely off-grid: there’s no heating system other than the power of the sun. But it’s built as a “tight house”: the north wall (on the right) is fully insulated with rigid foam board, while the south side (on the left) has three layers of plastic to let in the sun but keep out the cold. In addition, the aquaponics system in the greenhouse (blue barrels) has three black tanks of water with 800 gallons of water in them, creating thermal mass as the tanks get warm during the day. All this, plus the thoughtful positioning to maximize solar exposure, means that it never gets colder than 25 F in the greenhouse, even when the New England winters get down to -12 F outside. On a sunny day in January, it can get up to 85 F inside. So many hardy varieties of tropical plants do very well, even through the winter. The front yard is another spot where Eric and Jonathan have been able to create a near-subtropical (zone 7) microclimate, thanks to the south-facing aspect and the driveways which accumulate heat all day long. The plants here include taro, pomegranates, muscadine grape, sweet potato, and hardy banana. Eric and Jonathan’s focus and passion is really perennial edible plants. 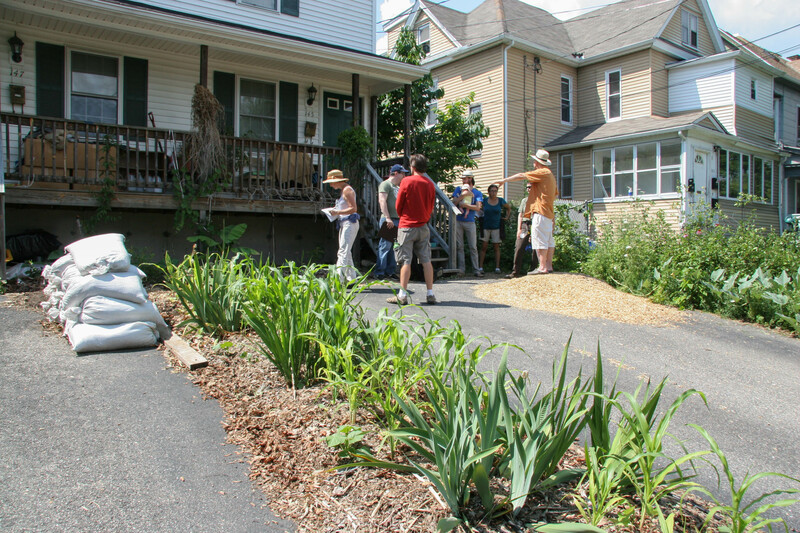 But there are also some annual vegetable beds, as well as non-edible plants that fulfill other functions such as attracting pollinators or providing nutrients for the edibles. Below, Eric is standing next to a bed of cow pea greens (apparently a delicious and easy summer green) while pointing out the Korean pig plant, the hot spot for all the beneficial insects coming to the property. 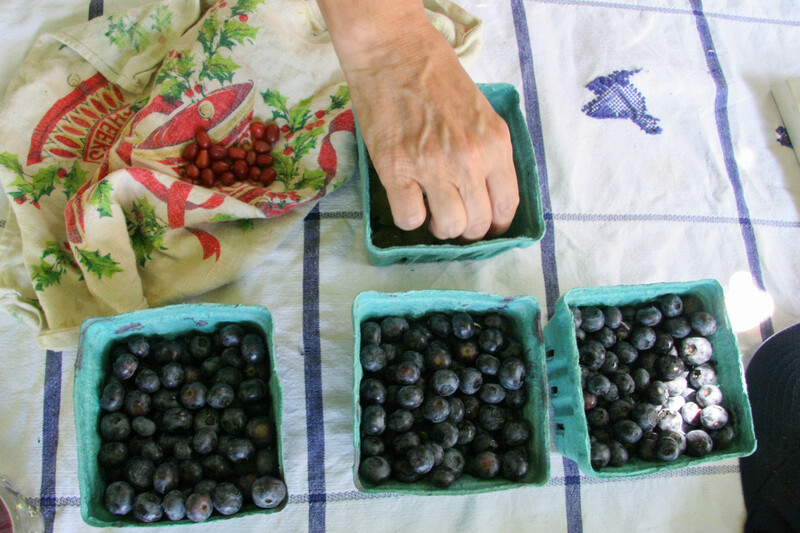 I came back with a head full of ideas and inspiration — and a belly full of berries. 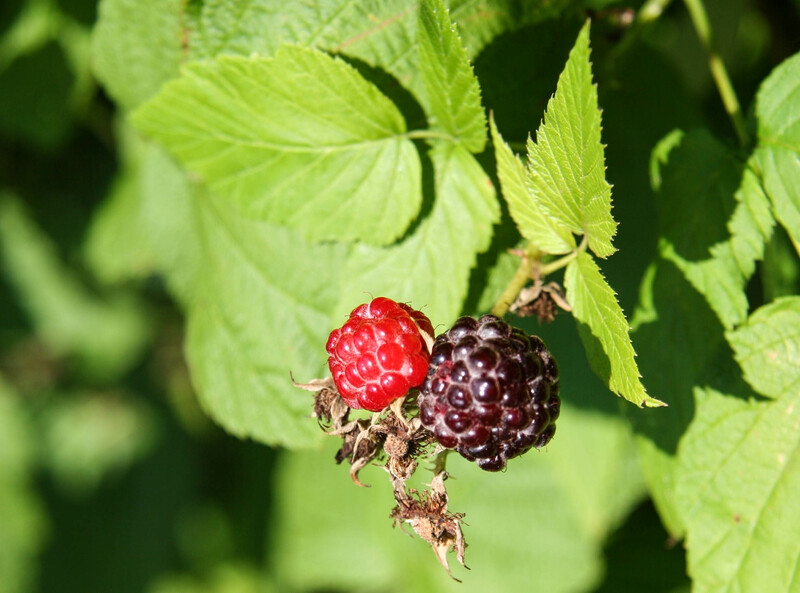 In addition to familiar berries such as blueberries and several varieties of currants, the offerings included new (to many of us) discoveries such as goumis, gooseberries, juneberries, or black raspberries. It didn’t take us long to develop a taste for them, as the photo below reveals. P.S. Eric is almost finished with his new book, due to be released in February 2015. It’s about “carbon farming,” growing food with this kind of focus on perennials and no-till systems while also sequestering CO2 from the atmosphere in the process. That’s a win-win, in my opinion. Read the book preview here — this is one to look out for! Awesome that you were able to visit this lot!